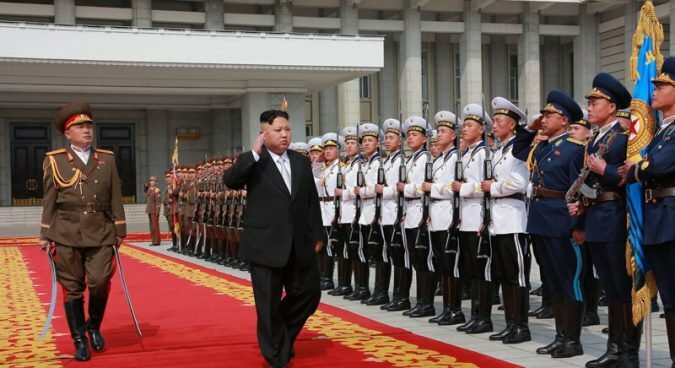 North Korea has claimed that the U.S. and South Korean intelligence services attempted to infiltrate its territory with the intention of carrying out a biochemical attack on Kim Jong Un during the April 15 Day of the Sun. In comments by the DPRK Ministry of State Security carried by KCNA on Friday, Pyongyang accused the CIA and South Korea’s National Intelligence Service (NIS) of having a North Korean worker abroad infiltrate the DPRK. “The heinous terrorist criminal group was discovered which infiltrated the DPRK after careful preparations,” KCNA said in a dispatch. The alleged assassin, who is only referred to by the surname “Kim”, is alleged to have worked as a lumberjack in the Khabarovsk Territory of Russia. “They hatched a plot of letting human scum Kim commit bomb terrorism targeting the supreme leadership during events at the Kumsusan Palace of the Sun and at military parade and public procession after his return home,” it continues. Kim was then instructed by the NIS to use radioactive material or nanoparticle poisonous material and was paid $20,000 and given a GPS to assist with the attack, according to the report. The report names Lee Byung-ho, the chief of South Korea’s NIS, an NIS team leader called Han, and an NIS agent called Cho Ki-chul, as having been “the frontman of the operation… around 80 times they have given instructions to the terrorist”. Reports name Xu Guanghai, allegedly the director general of “Qingdao NAZCA Trade Co. Ltd.”, written in the Korean version as “청도나스카상무유한공사”, as another “secret agent” involved in the plot. In January, May, August and September of 2016, contact was made with Kim, who was then residing in Pyongyang, and instructions were given about how to carry out the plot. No details are given about how the alleged plan was uncovered. The DPRK pledged that a retaliation against the NIS and the CIA “will be commenced from this moment”. “North Korean claims that a CIA/NIS plot to assassinate Kim Jong Un is preposterous,” LTG Chun In-bum, a recently retired three star general from the South Korean army – with significant special forces experience – told NK News on Saturday. “What is of concern is the fact that they have done so: The reasoning for such an action can only be answered by the North Korean Leadership. “One fact remains and that is it will raise tensions,” he said. “I feel that the free world must keep calm. Be vigilant but also to be careful in jumping to conclusions. South Korea’s National Intelligence Service did not respond to requests for comment. Oliver Hotham, Dagyum Ji, and JH Ahn contributed reporting.